This was our second time in the same apartment :) The apartment is near the ski lifts and six-seat cableways, so they can be reached on foot. There is a nice small pool in the building, and at the entrance there is a place to hire ski equipment and instructor if needed. The host left the keys for us in the envelope in the lobby and we had easy check. The apartment was well equipped, comfortable and clean. Clean, conformable and equipped apartment. Close to the slopes. Second year with SDL Apartments and will come again. Everything you need at your disposal. Really close to the ski lifts and gondola. Very warm, clean, large room. Quite close to starting points of the Gondola and Other ski lifts. Close to restaurants, bars and supermarkets. Parking space available. Spa, Massage facility also available. Very clean and comfortable place with SPA and a nice restaurant with good food. Can ski directly from the hotel to the gondola. Excellent value and Location. 2 minutes walk from the main gondola, and the bars and restaurants. The key was in an envelope with my name waiting for me. Nice apartment on perfect location next to gondola. There is a equipped kitchen, but we ate at the restaurant which is rather good. The hotel has spa center and ski rent. Excellent location near all lifts and main centre, a small studio apartment that suited our needs, the key was left for us in the foyer in an envelope, the studio was serviced daily for free, our kitchen area was very useful, (two ring cooker, fridge, kettle, pans, plates, cups, glasses, cutlery etc), also an ironing board but no iron, nice bathroom with fresh towels and free soap and shampoo, lovely view, very quiet, the restaurant in the bar area serves a very good selection of mixed nationality cuisine, we found the food prices about 50% cheaper than at the bars and restaurants in the main resort, the food is excellent, especially the fresh trout and calamari strips, the table service was mostly very good, also hunters on site ski hire is excellent. Wifi is free, all be it, a little slow. The appartment was very very clean! And contains evety thing you could imagain. I was very glad about this choise. Lock in a great price for SDL Apartments Flora – rated 8.9 by recent guests! 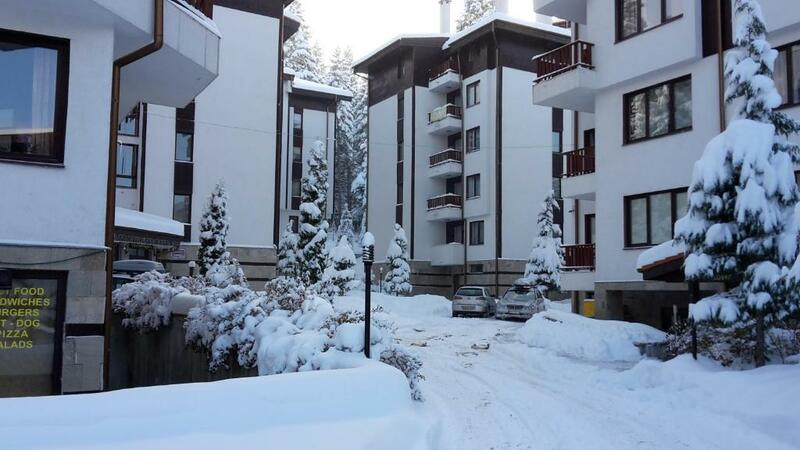 SDL Apartments Flora offers accommodations in Borovets and is located 650 feet away from the town center. Guests benefit from terrace and a sun terrace. Free private parking is available on site. The kitchen has an oven. A flat-screen TV and DVD player are provided. There is a shared bathroom with a bath. The apartment features free WiFi throughout the property. You can play table tennis and the area is popular for skiing. Guests can use spa facilities at a surcharge. Yastrebets Express is 0.7 mi from SDL Apartments Flora, Gondola Elevator is 650 feet away and a ski run for evening skiing is 350 feet away. Sofia Airport is 31 mi away. This property also has one of the top-rated locations in Borovets! Guests are happier about it compared to other properties in the area. 뀐 Located in the top-rated area in Borovets, this property has an excellent location score of 9.5! When would you like to stay at SDL Apartments Flora? This apartment has 2 balconies, a fully equipped kitchen and garden view. House Rules SDL Apartments Flora takes special requests – add in the next step! All children under 12 years are charged BGN 2 per night for extra beds. SDL Apartments Flora accepts these cards and reserves the right to temporarily hold an amount prior to arrival. Please note that free cleaning is done once a week, while light cleaning is done daily. Towels are changed every 3 days and sheets are changed every 7 days. Please inform SDL Apartments Flora of your expected arrival time in advance. You can use the Special Requests box when booking, or contact the property directly using the contact details in your confirmation. Sofa bed is suitable only for kids. Reception extremely unhelpful refused to help and said ask at the office but it’s closed. I only had 3 nights thankfully as a dog barked constantly every night and no one would deal with this which resulted in no sleep. No on there when we were ready to check out we had to wait thirty minutes for someone to take the key. Access to the entrance along the path from the car park area can be very slippery and dangerous when there is ice. Parking is free but it's almost always full. Reception had no idea about the whereabouts of the keys. Comfortable and spacious. Conveniently located. The making of the beds was not as neat as I would have liked. And the Massage in the hotel was not what I’ve used. The apartment is suitable for two people. The sofa is not comfortable for sleeping. No plugs near the beds, although we found a couple of extensions that reached the bed area, but left wires across the floor. More than one pan to cook with would be useful as would some cooking spoons and fish slice to get stuff out of pans, small details. A non slip matt inside the bath would help, it is very slippery and dangerous when showering, great water pressure though Overall, a very good place to stay and great value for money. Only some of the most important ones: 1, There was no heating just an old, slightly broken electric heater. 2, In spite of the lamp turned on, it was almost dark in the room (maybe the bulb was a bit too energy-saving). 3, The inside of the kettle was completely blackened. 4, The double room was made up of two single beds pushed together where the mattresses were continuously slammed. 5, We met with our host on the fourth day (prior to this, communication was conducted through an envelope in which we had to leave a form with our personal data. In the lobby of the hotel... Just as freely as it was...). 6, The breakfast was not €6 (as shown on the page) but 8 for that amount of money we could choose an item from a menu (where the smoothie was also a batch). I chose the traditional Bulgarian breakfast, which included 3 pieces of white bread, cheap ham ("gépsonka"), cheese, butter, jam, honey and some olives. I did not know before that Hungarian and Bulgarian gastronomy was so similar: Get the least possible and worst possible for as much money as possible. I would have been happy to point out these comments straight to the host if he would have spoken any foreign language.